Cupcake Friday at the office is Cupcake Thursday this week. I am taking a much needed day off Friday to stretch out the long holiday weekend!! Woohoo! 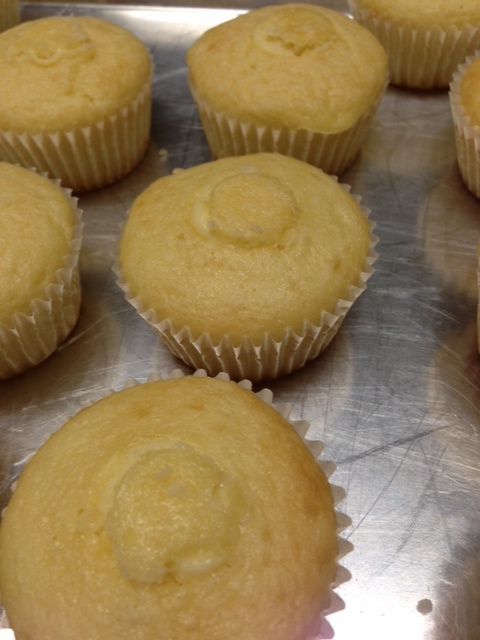 So, today’s cuppy is a vanilla cupcake, filled with a yummy pastry cream. 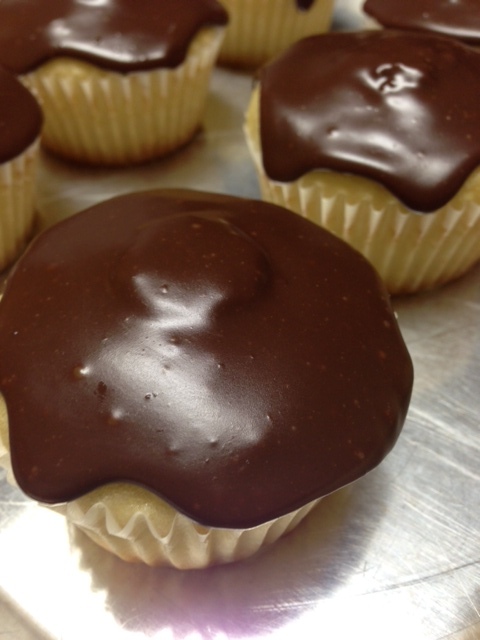 Then they are topped with a decadent sticky chewy chocolate frosting that is one of my favorites. OMG, this stuff is just dangerous. It’s like the best……..like eating a slightly melty fudge candy….but better. You could just eat it by the spoonfuls. But don’t do that! You will get a headache…. and probably go into a sugar coma. After all, it is pretty darned sweet. It will turn into a bad experience and you will never make this frosting again. So, just use it sparingly. 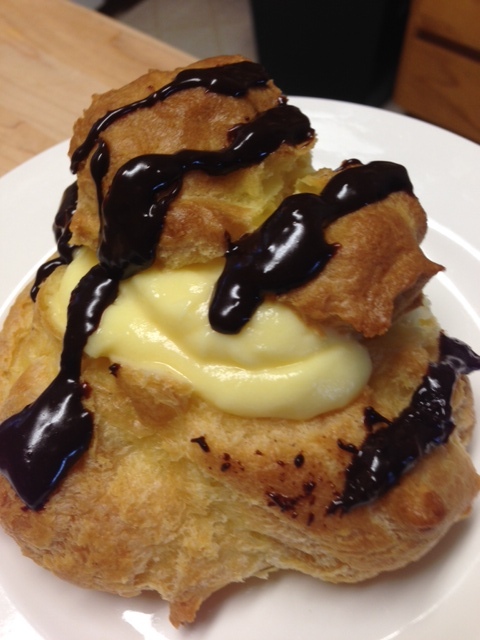 The pastry cream here is really good too. 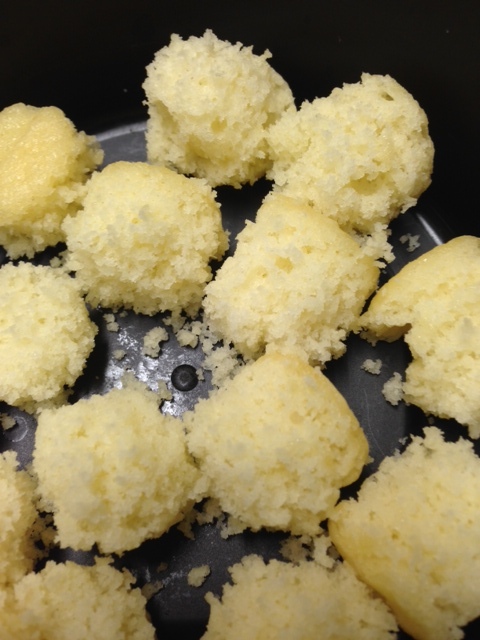 I used vanilla extract, but you can use orange zest, almond…..pretty much whatever you want to flavor your filling. Rum is good too! oh yeahhhhhhhhh. 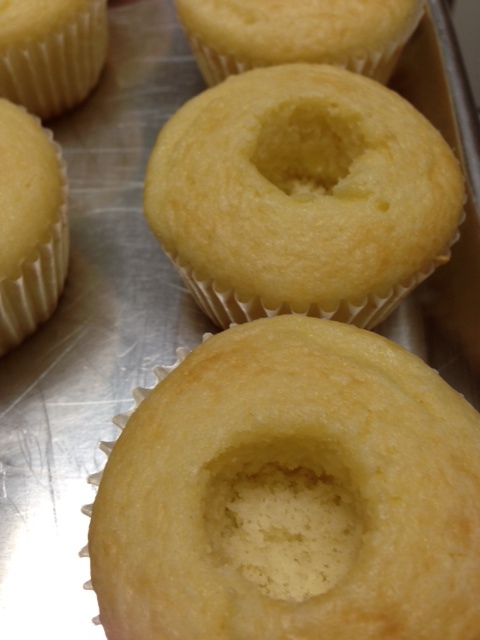 If you don’t have a little cupcake scooper thingy to make a hole in your cupcake, not to worry. Use a spoon, knife, or don’t make a hole at all. 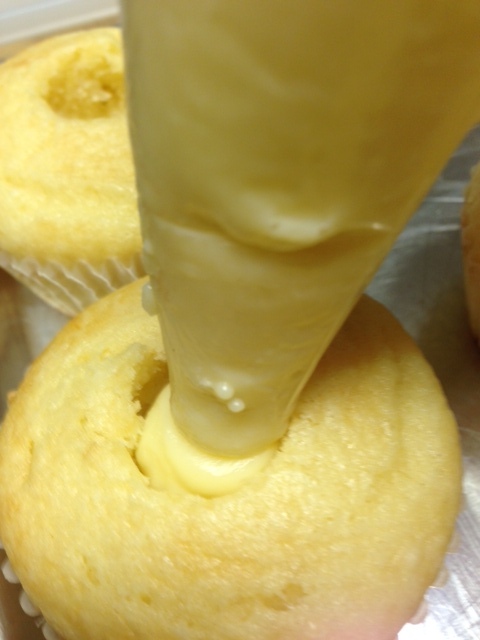 Just insert your piping bag tip right into the cupcake, and fill the cuppies that way. 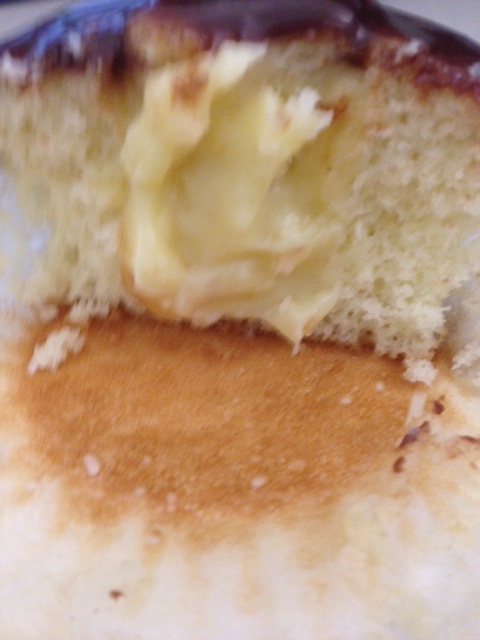 BUT DON”T SQUEEZE too much or you will have a cupcake explosion. 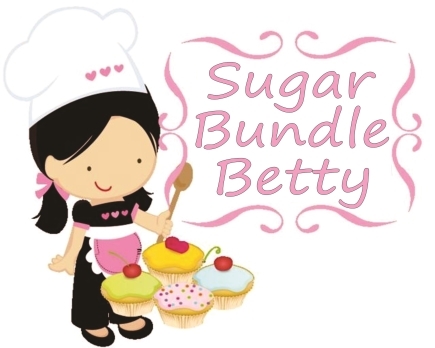 Hope you will make these and enjoy!! I used my White Velvet Cake recipe, listed in my recipe index. but instead of buttermilk, I used regular milk. Either works. In a saucepan, whisk the egg yolks. Add the cornstarch and the sugar to the eggs and mix together to form a paste. 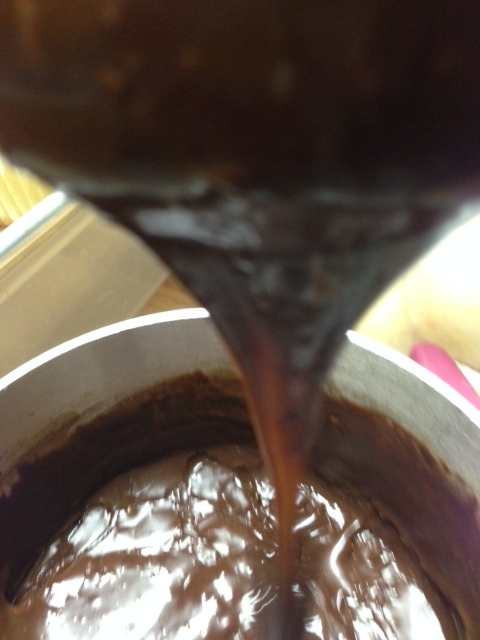 Slowly add milk to the paste while continuing to whisk. Turn heat on medium. Continue stirring until the mixture starts to bubble and boil. STIR CONSTANTLY. Don’t walk away. Don’t stop to fix yourself a drink, fold laundry, or pet the dog etc. STAY with it. If you don’t, you’re gonna have a lumpy scrambled egg mess. Remove from heat, add vanilla and chill for a couple of hours. Makes about 2 cups. When you’re ready to use it, mix it all up first if it has gotten too thick. 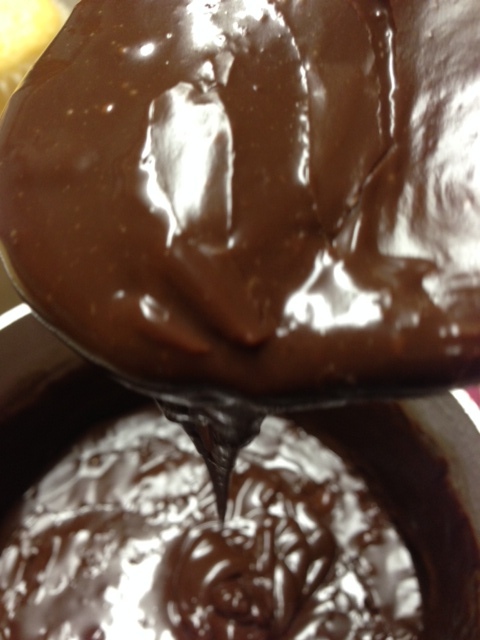 In a saucepan, heat the sweetened condensed milk and chocolate chips, just until the chocolate is all melted. Don’t let it burn. Remove from heat, stir in the butter. Let it cool for about 15 minutes. Stir and ready to use. Just slather it on and enjoy. Do you like sun dried tomatoes as much as I do? I LOVE them……those chewy, tart little pieces of joy. 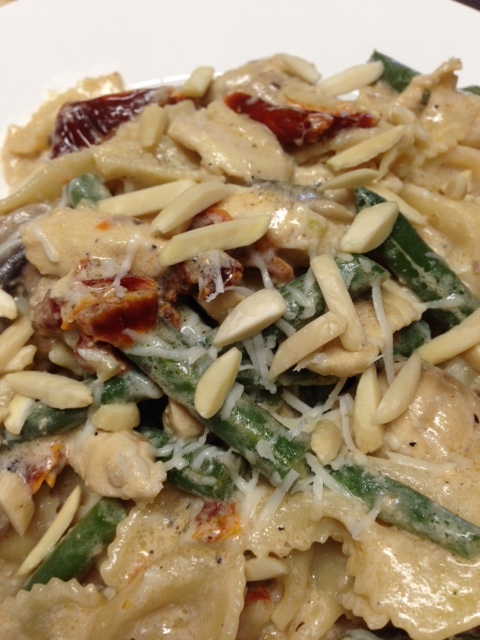 I have been craving them lately so I made this pasta dish that is so scrumptious. You can use any veggie that you like pretty much. My favorite is sun dried tomatoes, asparagus and mushrooms, but since the asparagus looked pretty crappy in the stores, I passed on that. 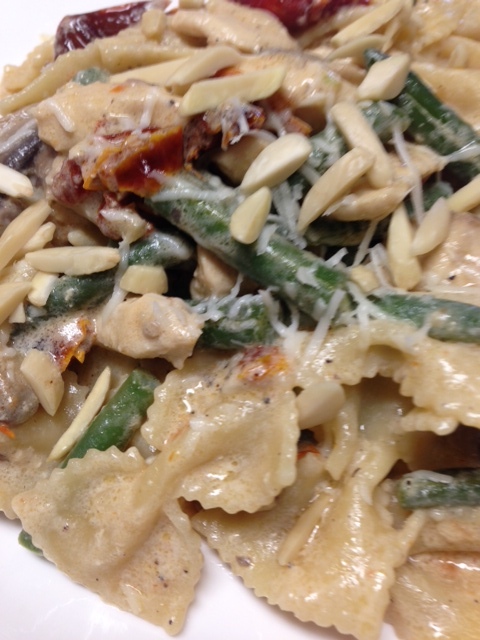 So I used fresh green beans and mushrooms. 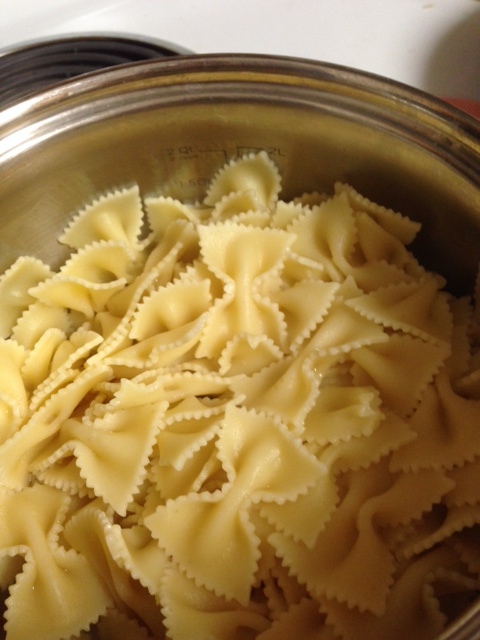 Use any kind of pasta that you want, but I love those cute little bow ties. For some reason, I get a kick out of the shape of those. But then again, pasta is good in any form, if you ask me! Boil your choice of pasta, drain and set aside. Pour olive oil into a large skillet. Add the butter and heat till butter melts. Add the chicken and stir fry till chicken is lightly browned. Remove the chicken and set aside. 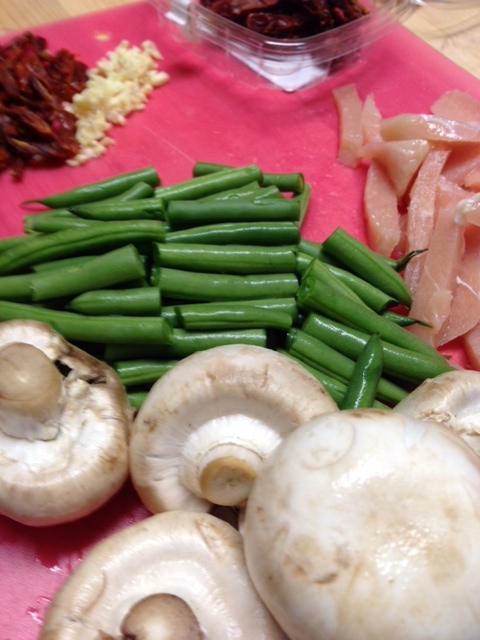 Add the green beans or asparagus to the pan and stir fry till tender. Add the garlic, sun dried tomatoes, mushrooms and the chicken back to the pan. Add bouillion cube, milk, wine and salt and pepper. Just let it simmer for a few minutes until everything has a chance to come together. Add your cooked pasta and stir until pasta is coated with all of that yummy goodness. Sprinkle with some grated parmesan cheese and devour. Bake for 20 to 25 minutes in the preheated oven, until golden brown. They should sound hollow when you tap them and the centers should be dry. If they aren’t, they will collapse on you……and that is a horrible thing. 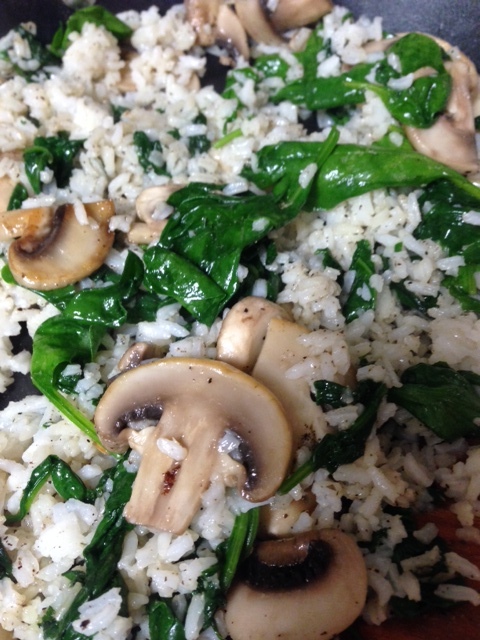 Leftover rice, some mushrooms and some spinach. This is one of my favorite side dishes. I LOVE rice. 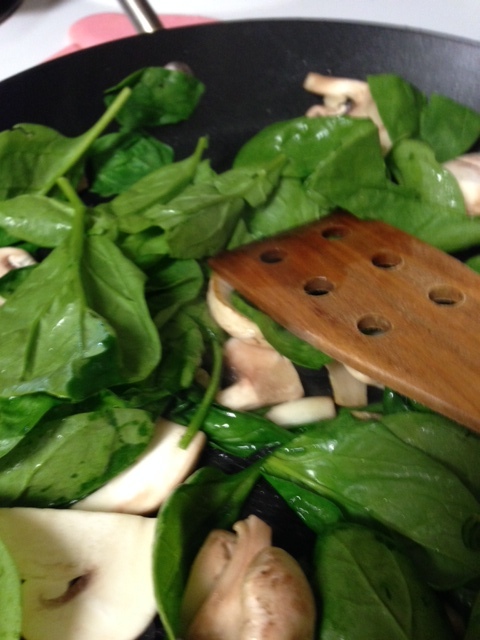 I love spinach. I love mushrooms. Since I had all 3 on hand, I had to make this. So easy, so yummy. It’s a great side dish to beef, chicken or fish. Everyone loves this and I know you will too! no measurements here. Just adjust to your taste. In a large skillet, melt some butter. Add the mushrooms and saute just until they are almost soft. 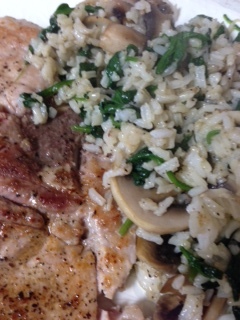 Add the garlic and spinach and then the rice. Stir it around till everything is heated. Add salt and pepper. Serve. 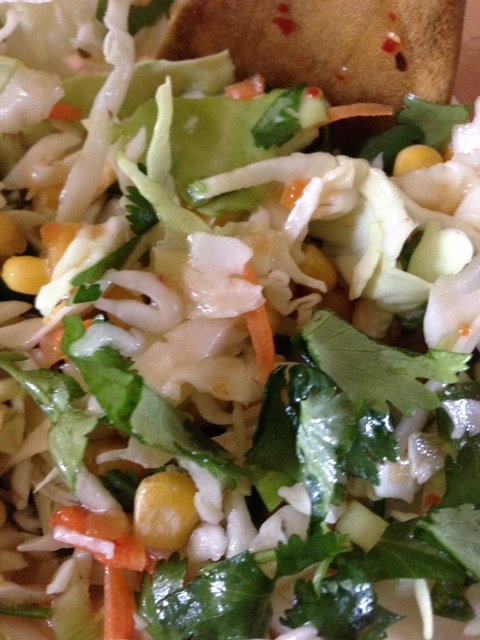 Awhile back I posted a recipe for Asian coleslaw. I am not a fan of coleslaw with the typical mayonnaise dressings. BLEKH!! Not my thing at all. That is why I like the Asian slaw and my Mexican slaw. Years ago I went to a Mexican restaurant in town and they serve a tiny little bowl of slaw with every meal. I noticed it had corn in it. Hmmm, that was interesting and I fell in love right then. SO yummy. This Mexican slaw is super refreshing and simple. I served this with some melty cheese quesadillas for guests recently. Perfect, non complicated meal. 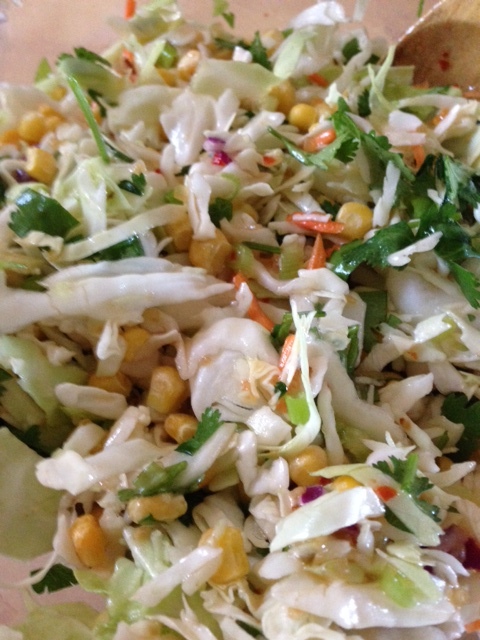 So, if you are experiencing miserably hot weather like we are…..and your hair is all sweaty and plastered to your face and your clothes are sticking to your sweaty body and you have no energy and you are looking for a light refreshing dish, you just may want to try this slaw. Not saying it will cool you off or anything, but it won’t just lay there in your gut making you feel all weighted down and miserable. Try it! Toss everything together and chill. That’s it!! Great with some shredded chicken mixed in, too.